Debora completed her massage therapy diploma with Sutherland Chan School of Massage Therapy in 2000, and worked in their clinic for two years, before joining the Bellesmere Massage Therapy team in 2002. 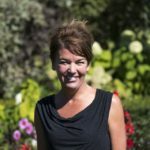 Debora believes in taking a holistic approach to achieve optimal health through various massage techniques and works with her clients to develop an effective treatment plan to address their particular needs. Debora specializing in targeted deep tissue massage, myofascial release and trigger point therapy. She is very experienced in working with clients presenting with chronic neck, jaw and shoulders conditions. Debora’s desire to assist her clients in resolving chronic conditions has lead her to continuing her education in Cranial Therapy, a form of osteopathic technique that focuses on the treatment of injuries to the head and spinal column. This treatment is specifically helpful to those who have suffered falls and motor vehicle accident injuries. Debora has completed Level 4 of the Cranial Therapy studies and is continuing into advanced training courses. Debora volunteers her time to various corporate health and wellness events and fund raisers for The Scarborough General Hospital and Native American Rehabilitation Centre for Drug and Alcohol Abuse.